My husband gave me this book for Christmas one year after seeing it on my Christmas list. It had gotten good reviews and the tie-in to Jane Eyre was a sure sell for me. I hoped I would like it, but admit I was a bit weary given it was a twist on one of my all-time favorite novels. I cannot even begin to tell you how much I loved this novel from the story itself to the references to Charlotte Bronte's Jane Eyre. It is obvious Lyndsay Faye is paying homage to the original. This satirical take on the classic Jane Eyre could not have been more perfect. It is witty and charming, dark and suspenseful, and ever so dramatic with just the right amount of romance. Jane Steele's life mirrors that of her favorite literary character in many ways. Only not so much in others, as Jane Steele will point out to the reader. Written in an autobiographical style, Jane often references Bronte's novel, comparing herself and her life to that of the novel's heroine. Orphaned at a young age, Jane finds herself at the mercy of an aunt who hates her and a lecherous cousin. Seeking escape, she agrees to attend a boarding school where life couldn't be more worse. After an unexpected turn of events, she and a friend flee to London where they do their best to get by. There may be a body or three--maybe more---that are left behind in Jane's wake. She isn't one to suffer being a victim easily, nor does she like to see those she cares about taken advantage of. Jane has long seen herself as a sort of bad seed, on the path to hell for sure. She is guilty of murder and has little regret. When making a living as a writer of macabre "last confession" sold on the street, she comes across an ad for a governess at the very house she had once lived as a young girl. She had been led to believe the estate was hers by birthright and comes up with a plan to reclaim what should have been hers. And so on to Highgate House she goes under an assumed identity, taking up a post as the governess for a young Indian girl adopted by the master of the house, Mr. Thornfield, a former army doctor recently home from the Sikh Wars. Jane soon learns that not everything is as it seems at Highgate House, the Sikh butler, Sardar Singh, is more than he appears, and there are secrets--dark secrets--that Jane is determined to uncover. The more she learns, the closer she and Mr. Thornfield grow. But with her past and his secrets, is it possible for them to find their happily ever after like Jane Eyre found with her Edward Rochester? 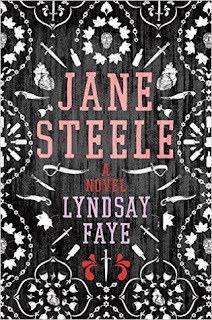 I was captivated by Lyndsay Faye's novel from the very first line and soon smitten with Jane Steele and her tale, even as cold as she could seem at times. The historical detail and the literary references make this novel all the better. I had not known much about the Sikh Wars before reading the novel, admittedly, but I soon found myself wanting to know more. I loved the more feminist twist on the Jane character and appreciated the research Faye went into to capture the time period so well. While some may not appreciate a serial killing version of a beloved character, I was quite taken with this homage to one of my favorite novels. I look forward to exploring more of Lyndsay Faye's work. I enjoyed this so much (more than the original)! I'm so glad that I saw this book on your blog and so happy to read your review! Makes me want to re-read the book! Eustacia - I remember you liking this one more. :-) I definitely want to re-visit this one at some point. I've heard a lot of good reviews about this book so will add this to my wishlist. Hmm! Not a fan of Jane Eyre or indeed most of the so-called classics of this era so I think I'll give this one a miss. Sounds like it was well written though. I'm glad you enjoyed it. Tracy - This one doesn't read much like a classic even if it is a satire of the original; and many have liked this one even when they didn't like the classic it is based on. It won't be for everyone though. Jane Eyre is my favorite classic, and I picked this up a while back. I'm glad to see that you liked it. After reading your bookish thoughts, I think I will read it sooner. Jovita - I hope you end up liking this one as much as I did! Isn't it fun to see how Faye turns everything upside down? Love her writing! Jenclair - Yes! It was fun to see her do that. I am so glad I finally read this one. I have this book sitting on my bookshelf. I haven't read Jane Eyre but this version does appeal to me. I am so glad to hear that you enjoyed it! Carole - You really don't need to read Jane Eyre to read this one--so don't feel you have to. This is a good one on its own, I think. I read Jane Eyre years ago. I love books that are inspired by other books with their own twist. As long as it is not a copy and paste of the original book, it is all good to go! Elle - This is definitely not a copy and paste! I had heard Pride and Prejudice and Zombies was just that and decided it wasn't one I want to read--so I know what you mean. Lark - I hope you will give it a try! What have you read by her that I should read? Mystica - I look forward to reading more by this author. Yay!! I'm so glad you enjoyed this one! I did too when I read it. I LOVED the writing style! I have to reread this one soon! Erica - It was such an amazing book. I plan to re-read it at some point too! This sounds really interesting and not exactly what I was expecting. I can see how some people would have an issue but while I enjoyed Jayne Eyre I'm not devoted to her so I don't think I'd have a problem with it. Katherine - I think those of us who love Jane Eyre will definitely fall within two camps on this one. Either we will love it or not. It was a lot of fun, I thought. A great play on the classic. If you decide to read it, I hope you enjoy it. Well, Wendy....I think you know which camp I'm in, lol. I don't like books about serial killers, so I won't be reading this one! Especially not since the author takes such liberties with the original, which is my favorite classic of all time! I really enjoyed reading your review, though! I loved your insights on this novel! Your mention of the things you most enjoyed about this book also made reading your review very interesting! I'm excited to see that your review for this book is just as glowing as my sister's was. I'm going to have to borrow her copy the next time I see her. Great review! Jason and I were able to see the Broadway version of Jane Eyre a few months ago and I'm still singing songs from it (check it out of your library of you can, such great music). I'll have to add this to my list, I hadn't because, like you, I'm wary of anyone messing with Jane.